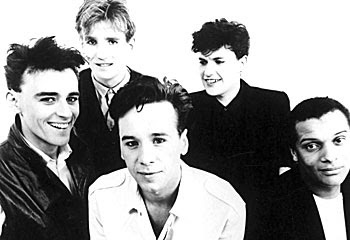 WAIST HIGH: Simple Minds' Original Lineup To Record Once Again. Simple Minds' Original Lineup To Record Once Again. The original members of Simple Minds are said to be back in the studio working together for the first time in 27 years. In an event that many never thought would happen again, Brian McGee, Derek Forbes, Mick McNeil, Jim Kerr, and Charlie Burchill, have set their aim on producing at least two new tracks that could be released later this year. Regarded by both Jim and Charlie as a "nice experiment," particularly as it falls within their 30 year anniversary, the week-long reformation is being viewed as one of many "let's see what happens" ideas that they look forward to working on over the course of the next year. Kerr says, "Of course I am excited with the prospect of working with the original line-up once more. I had always believed that the day would come when we would get the opportunity to do so. The last time we worked together was on our Sons and Fascination/Sister Feelings Call album, featuring songs like 'The American,' 'Themes for Great Cities,' 'Love Song' etc, and it is still considered by many as among our best ever work. We have a lot to live up to, but we intend to have some fun attempting to do just that."